The Homy Feel Air Purifying Bags contain high only quality bamboo charcoal made from bamboo five years or older. Fresh bamboo plants are treated at 800°C to 1000 °C in brick kilns for several weeks to form charcoal with millions of porous microstructures that absorb pollutants and excess moisture. Only the optimal size of charcoal particles are chosen for Homy Feel Air purify Bags that are the best for purifying. The microporosity of the charcoal provides more than sufficient surface area that absorbs gas molecules naturally without any chemical reactions. While the purifying process is not immediate as with chemical sprays, it is the best safe and healthy way to purify air. Bamboo charcoal is scientifically proven to be an efficient way to remove harmful chemicals from paint and new furniture. Pader Je Airpurify Bags also absorb other unpleasant odors such as smoke, pet smells, and cooking residues. The Homy Feel Airpurifying Bags also removes excess moisture that might create mold and bacteria. Typically a 500g Homy Feel bamboo charcoal bag will cover up to 250 sq ft; a 100g bag can be used for up to 50 sq ft. For faster results, we recommend doubling or tripling the number of bags by placing them evenly throughout the space so there is better contact with the air flow. It is suitable in every room of a home, including the kitchen and refrigerator, the bedroom closets and clothes drawers, the bathroom, basement, pet space, and car. Inside your car, the best way to eliminate odors is the place the charcoal bag overnight and remove it during the day. Direct sunlight and heat during the day might cause the charcoal bag to release odors. Place the bag where it will have the most air flow, such as at an air conditioner vent or simply hang it in the air with the hook included. Recharge your bag every month by placing it in direct sunlight for a couple of hours or more frequently. Homy Feel Air purifiers bag with nature material,made up with top class bamboo charcoal, best odor absorber for itchen and refrigerator,the bedroom closets and clothes drawers,the bathroom,basement,pet space,and car. Clear your house in a nature way- processed with high temperature oxygen-free carbonization, then choice the best charcoal.Fragrance Free(Bamboo Charcoal Bag itself does not smell), Chemical Free and Non- Toxic,Reusable for up to 2 years! Best dehumidifier and eliminate all odors- Wet and moist air usually causes bad smell and mildew, bacterial and mold will grow with strange odor. Use our products to clear them all.Better than baking soda. Easy to Use-Just hang them on the bedside, wardrobe, or just put in a corner of your car, fridge, etc. 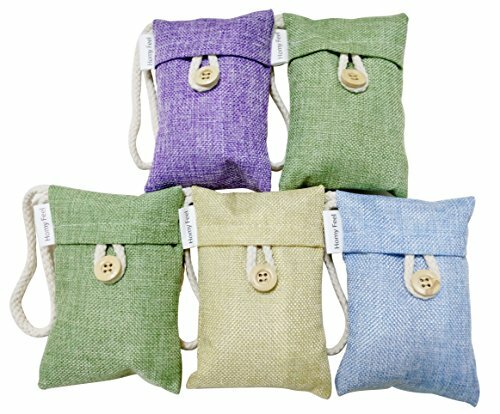 Bring our Homy Feel natural air freshener bags to clear your air. Homy Feel activated charcoal bag is perfect odor remover & deodorizer! Excellent housewarming gift set! If you have any questions about this product by Homy Feel, contact us by completing and submitting the form below. If you are looking for a specif part number, please include it with your message.